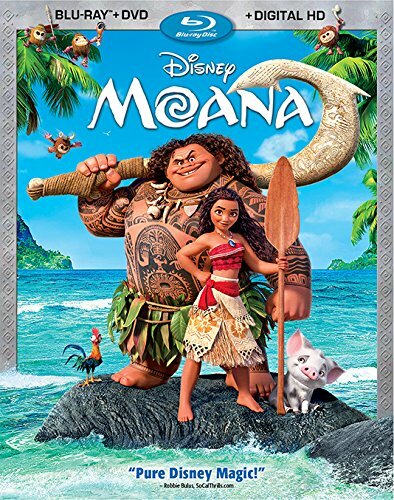 Moana is a beautiful film about a teenage Hawaiian princess that must team up with a demigod named Maui to return a special stone to the goddess Te Fiti. The animation is fantastic, including all the different forms of water, rocks, sand, and hair (both wet and dry). But beyond they visuals, it's also a treat to listen to. The actors really bring their characters to life, and both Auli’i Cravalho as Moana and Dwayne Johnson as Maui have great singing voices. I liked pretty much ever song in the movie, which is rare for me. I liked the adventure aspect of the film, where a young woman goes off on adventure to find herself and her place in her society. It's basically what I was expecting Brave to be (that was a good movie too, just not quite what i was expecting). The interaction between the two main characters was enjoyable to watch, especially how it transformed over the span of the film. The inclusion of a non-talking yet still hilarious chicken sidekick added in some great comic relief. The special features included in this release were fantastic as well, especially the audio commentary. Sometimes those can be dull and boring but this one was very interesting to listen to. There's also a bunch of mini making-of featurettes, deleted scenes, and an animated short, so there's a lot to like here. Moana , released by Walt Disney Video, is available starting March 7, 2017. BURBANK, Calif., Jan. 13, 2017 — Walt Disney Animation Studios’ “Moana,” the sweeping story of a spirited teenager who sets sail on a daring adventure to save her people, starring newcomer Auli‘i Cravalho as the voice of brave and tenacious Moana and Dwayne “The Rock” Johnson (HBO’s “Ballers,” “Central Intelligence”) as the larger-than-life demigod Maui, has dazzled both critics and audiences. The film earned a 95% critics’ consensus on Rotten Tomatoes and the No. 1 spot at the domestic box office opening weekend. Now, “Moana” sets a new course, arriving to homes on Digital HD/3D and Disney Movies Anywhere (DMA) on Feb. 21, and on Blu-ray 3D™, Blu-ray, DVD and On-Demand on March 7. PG in U.S., PG in CE, and G in CF.